Happy first day of March from the stunning village of Monteriggioni where the sun starts to warm this beautiful morning. We’ve decided to take a relaxing walk to discover this beautiful Tuscan town. In this area, it is possible to find really enchanted village to visit and discover. You will find the real Tuscan lifestyle not only in Florence but most in the small villages all around the region. This is why we love to know more about our region: Tuscany is a constant surprise also for us. We want to find and show, to our guest, the hidden part of this incredible land. 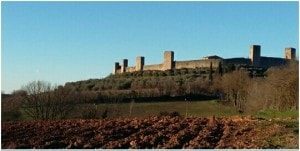 Monteriggioni is in the province of Siena, between this beautiful city and Colle Val d’Elsa have a perfect circular perimeter. The castle was built by the Siena between 1213 and 1219 for defensive purposes, due to its strategic location. The intact fortified wall presents 14 towers along which the guards used to walk and patrol. There are also two gates which composing the wall. The first one is the “Romea Gate” which faces Rome and the other known as the “Florentine Gate” since it heads toward Florence. We love so much Monteriggioni because it seems to be in a film talking about a medieval story. There are many legends and interesting stories connected to this charming village, let’s discover them together!